Designer Kerby Jean-Raymond appears on the runway at the Pyer Moss fashion show during New York Fashion Week on September 11, 2016 in New York City. This year, Jean-Raymond also scored a 2018 Emerging Talent award nomination from the Council of Fashion Designers of America (CFDA). While he didn’t take home the prize this year, on Monday night he scored another big win—and major investment—when he was announced as the 15th annual winner of the 2018 CFDA/Vogue Fashion Fund in a celebration at the Brooklyn Navy Yard, not far from his childhood home. 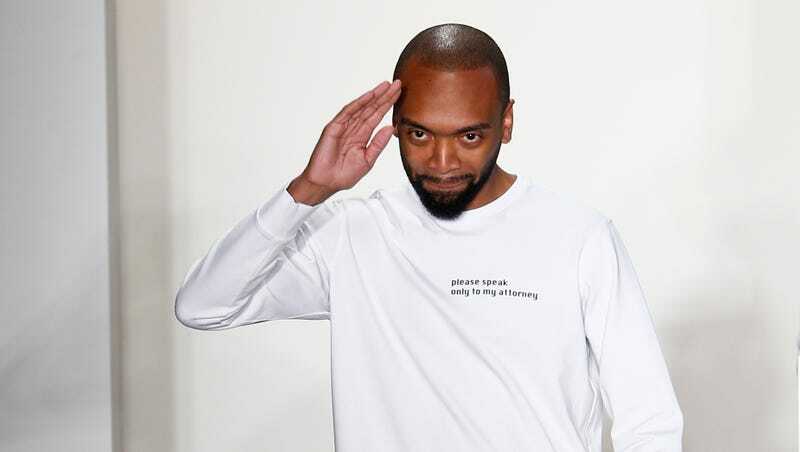 Jean-Raymond, who was the only black contender among this year’s 10 finalists (following 2017's winner, fellow black designer Telfar Clemens), was chosen as 2018's winner by a committee of industry luminaries, insiders and influencers such as Anna Wintour, designer Joseph Altuzarra, and Instagram’s Eva Chen (a panel that was criticized for not including any black judges this year). The win was a culmination of many months competition between the finalists, including design challenges and branding exercises. The prize? Four hundred thousand dollars and a year of mentorship. The runners up for the CFDA/Vogue Fashion Fund were Emily Adams Bode of menswear label Bode and womenswear designer Jonathan Cohen, each taking home $150,000 each. Undoubtedly, this incredible honor—and infusion of cash—will result in even bigger things for our favorite label on the rise. You can check out their current offerings here.